I was excited to learn that the Yale Center for British Art will be exhibiting the work of Mrs. Delany in a show titled Mrs. Delany and Her Circle. Some of you might remember my posts on Mrs. Delany, one of 18th c. England's most noted paper mosaic artists. The show, co-organized with the Sir John Soane's Museum, will feature many of her paper cutouts as well as what is described as a court dress embroidered with naturalistic flowers. The show runs from September 24, 2009 through January 3, 2010. While you're there, you might also want to see Horace Walpole's Strawberry Hill. The exhibit made its debut at the V&A a while back. Alas, I never made it to the V&A to see it, so now is my opportunity. To read more on Strawberry Hill (a home that Carolina Irving cites as inspiration), there is a great book that came out a year or so ago-Strawberry Hill: Horace Walpole's Gothic Castle by Anna Chalcraft. 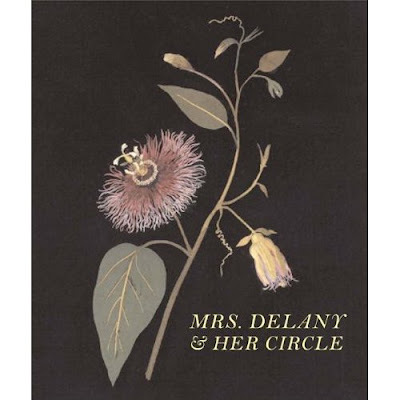 Yale University will be releasing a book on the Delany exhibit in December titled Mrs. Delany and Her Circle . 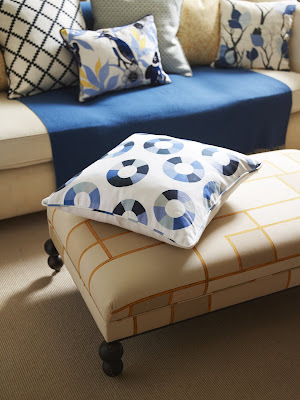 Thanks to the recent House Beautiful article on the Miles Redd project (July '09), I learned about a new fabric line, Tulu Textiles. 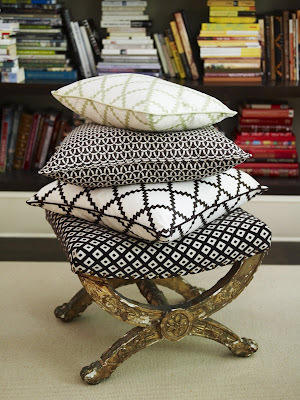 Based in Istanbul, Tulu was founded by American ex-pat Elizabeth Hewitt and includes hand-printed fabrics, bedding, pillows, and other decorative items. What I like about the line is that it has that Ottoman look to it, but the fabrics and pieces aren't so heavily exotic that they wouldn't work well with more traditional, or contemporary, fabrics. 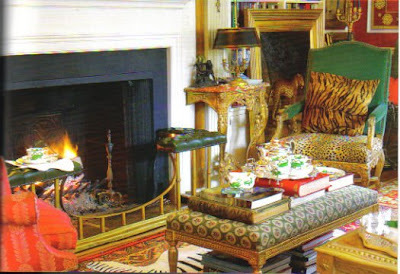 That's one complaint that I oftentimes have with some exotic fabrics- you use a lot in a room and you look like you're trying too hard to channel Talitha Getty, or you incorporate one and it sticks out like a sore thumb. Tulu's don't feel like that at all to me. "Madame Farfalla" fabric- I am so taken with this print. Gorgeous! 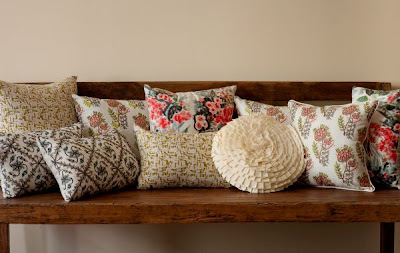 Pillows using "Mejiju", "Clara", and "Yejiju"
Image at top: From left to right, fabrics include Pink Gigi, Tashkent, Kezban, Madame Farfalla, and Cream Bathing Beauty. A while back I posted an image of a Manhattan rooftop garden that I found so captivating (that image is featured above). 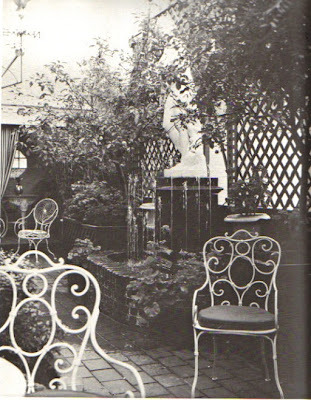 Included in a chapter in Tiffany Table Settings , the terrace seems so evocative of chic 1960s New York- at least it does to me. 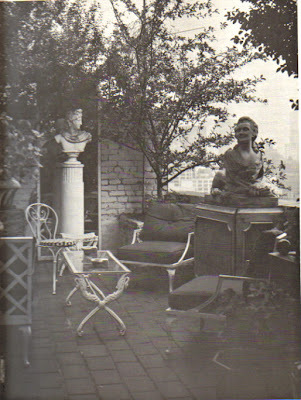 Well, the terrace that I fancy has turned up again, this time in America's Small Houses: The Personal Homes of Designers and Collectors (1964), and I've learned that said terrace belonged to antiquarian Churchill J. Brazelton. 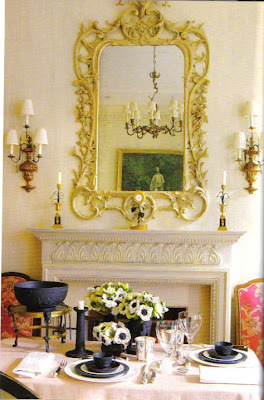 New Jersey designer Janet Simon knows a lot about entertaining and sets a table with perfect aplomb. Since yesterday's post was about Wedgwood, I thought it appropriate to ask Janet for some tips on entertaining. 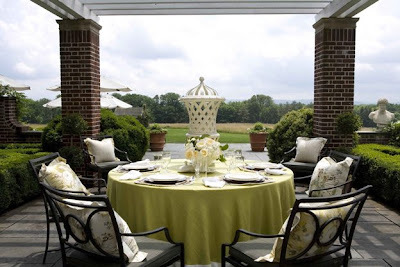 She kindly shared with me photos of a garden luncheon that she hosted for four of her closest friends in the garden at her home, Hidden Pond Farm. Janet said "In early June the parterre garden at Hidden Pond Farm is an outdoor room of boxwood hedges and topiary iceberg roses. The brick and slate roofed garden house is covered with climbing iceberg roses and sloping brick walls while surrounding the remainder of the garden is in full bloom with white flowering clematis vines. Four brick columns with limestone capitals support the wooden pergola. 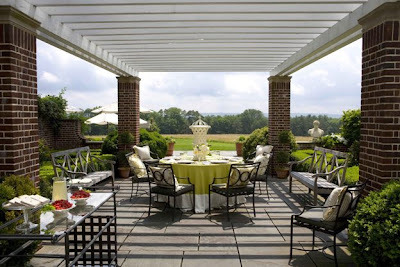 This space is the inspiration for my classical themed luncheon." For the beautifully appointed table, Janet used a round table covered in a heavy linen summer leaf green cloth with white linen monogrammed napkins (HPF for Hidden Pond Farm). 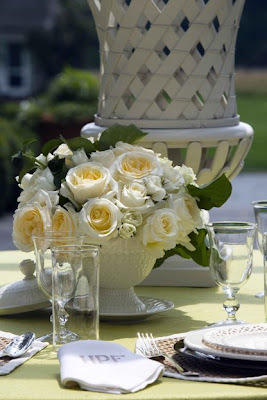 In the center of the table was a French wooden lattice white washed urn, and an 1830 English creamware compote was filled with white garden roses and dark green hydrangea leaves. 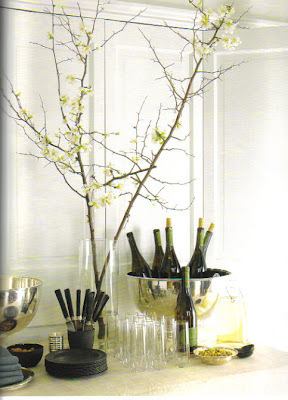 Italian pottery buffet plates and hand blown goblets rounded out the look. 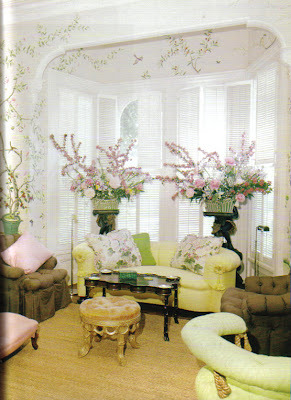 Janet added green chintz pillows to the wrought iron chairs. The menu included a platter of prosciutto, mozzarella, and tomato with bunches of fresh basil and light oil vinaigrette. The lattice creamware bowl was filled with raspberries and fresh mint while whipped cream with lemon zest accompanied the berries. Janet also served handmade painted sugar cookies of white roses and trellis boxes monogrammed with HPF. Talk about attention to detail! The signature drink was iced tea with orange juice garnished with mint and orange slices. 1) Keep it simple. You want the luncheon to be relaxing so you can enjoy your guests' company and have a nice time. 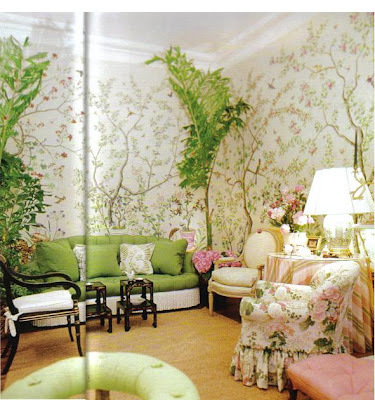 2) Start with a natural theme. Don't over think it. The best way is to select a theme that works with your space. 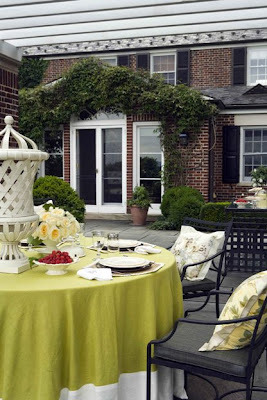 Choose elements about your garden or outdoor space that can be incorporated into the luncheon. 3) Repeat an element. Find an element that you can use to bring it all together. Maybe it's an architectural aspect of the garden, maybe it's the flowers. Whatever you decide, repeat that element in creative ways. 4) Don't get caught up with over-complicating the food. The food you serve should be an opportunity to have fun and should be easy to prepare. Try serving food that everyone enjoys but have fresh ingredients in abundance. If you don't have your own garden, visit your local farmers market and select items that are in season. The freshness, and the fragrance, of the local food and herbs will add character to your luncheon. 5) Have a signature drink. Maybe it's champagne; maybe it's pink lemonade; whatever your drink is, show it and serve it with pride. A cold, refreshing drink is the best way to complement the environment. Visit Janet's website for more photos of her parties at Hidden Pond Farm. 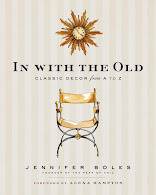 Recently, I was thinking about my favorite Tiffany & Co. tablesetting books from the 1980s and 90s (The New Tiffany Table Settings , Tiffany Taste , and The Tiffany Gourmet Cookbook ) and lamenting the fact that there haven't been many books of late that have captivated me like the Tiffany books. 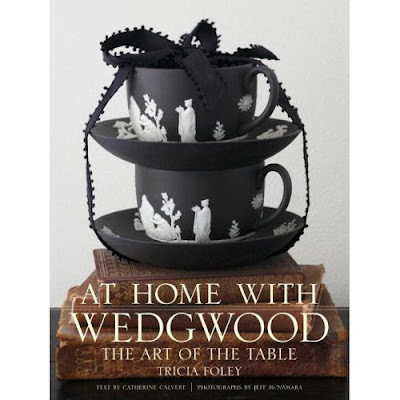 On a lark, I ordered At Home with Wedgwood: The Art of the Table by Tricia Foley and frankly wasn't sure what to expect. I just received it yesterday, and guess what? No more lamentation- this book looks fantastic. 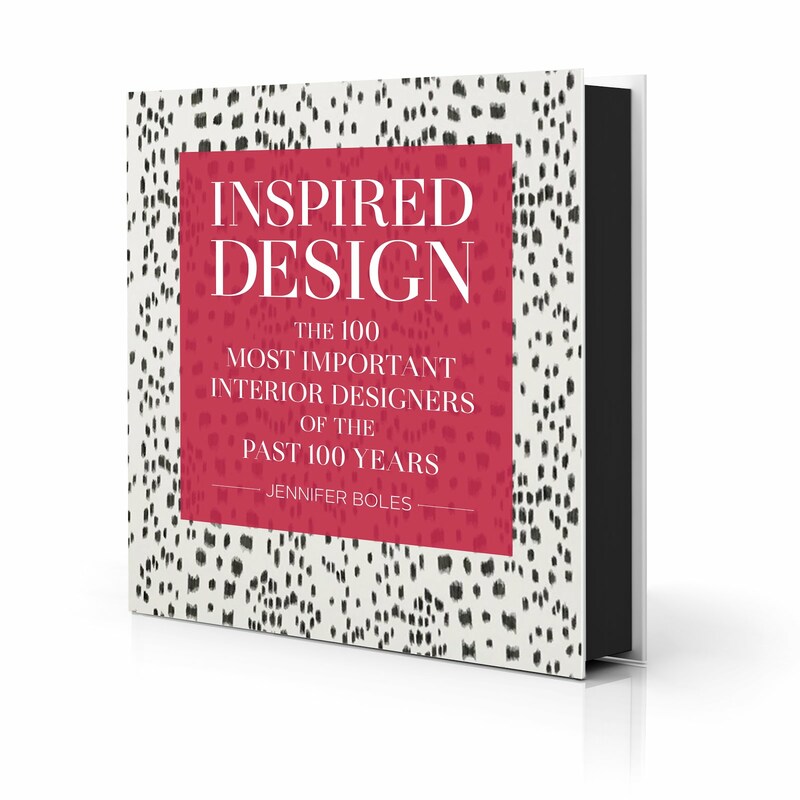 The book discusses the illustrious history of Wedgwood china and includes chapters on prominent Wedgwood collectors, including Suzanne Rheinstein, Charlotte Moss, Stephen Drucker, and Michael Smith. To be honest, I didn't have a chance to read the text last night. But if the photos are any indication, the text should be quite interesting too. 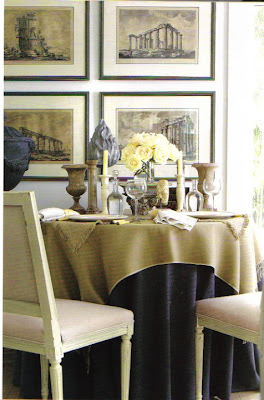 Designer Diane Martinson created a Neoclassical look for her home; the table is set with Wedgwood candlesticks in the Edme pattern. Charlotte Moss set a table for a post ballet supper using Wedgwood black basalt and creamware- all set on a pink tablecloth. Gorgeous. Stephen Drucker is an avid collector of black basalt portrait busts. In this photo taken in his apartment, a basalt wine ewer and a collection of over 500(!) 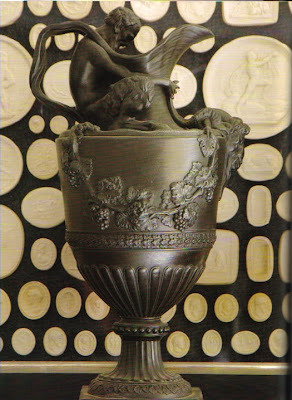 reproduction plaster casts provide a graphic display. Now I'm inspired to start collecting plaster casts. 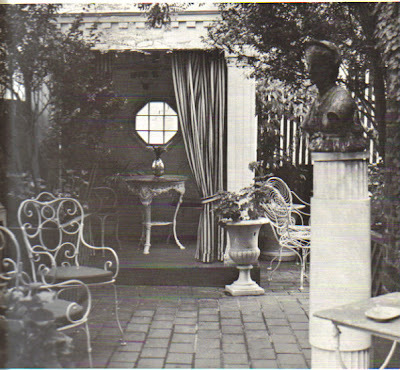 Lord Wedgwood's home outside of Philadelphia. (I thought for sure it was in England.) The green Chinese Tigers teacups are a c. 1984 Wedgwood pattern. 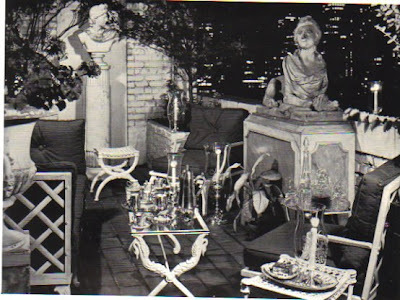 Author Tricia Foley's Upper East Side apartment where drinks are set on a table with black basalt ware and silver punch bowls used as coolers. Anytime I have friends over for dinner, I always cook something from one of Ina Garten's cookbooks. Her recipes always turn out well (or at least they have for me), and people think you've been slaving away for hours in the kitchen- but you haven't! The great thing about Ina is that her philosophy is about the basics- but basics that produce sophisticated results. If given the opportunity to build a kitchen from scratch, I would love to consult Ina and have her guide me in creating the ultimate kitchen, but one that is truly functional. No kitchen building from scratch for me right now, but in the meantime I've been having fun looking at images of House Beautiful's Kitchen of the Year designed by Robert Stilin and Ina herself! I love that it's white (Van Day Truex said kitchens should always be white) without seeming sterile. 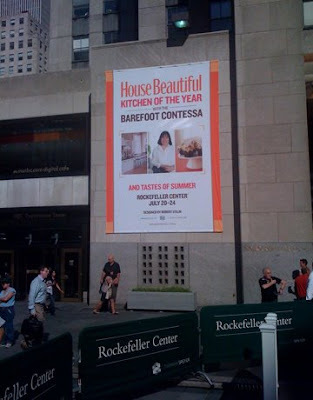 If you can't visit the kitchen in person, visit House Beautiful's website for a slide show. Also, make sure to check out the videos featuring Ina and Stephen Drucker discussing all aspects of kitchens- color, kitchen gadgets, and entertaining. Ina also gives you a tour of the kitchen on the video page as well. 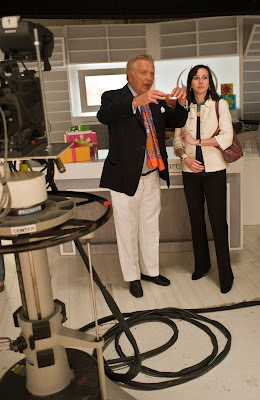 I just returned from Tampa, and let me start by staying that I'm now completely smitten with Carleton Varney (that's him above on the HSN set). 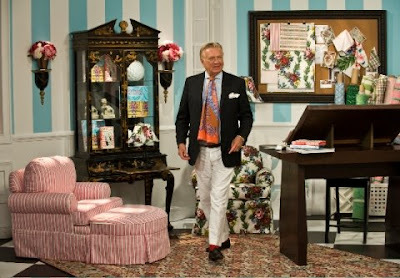 Any man who wears bold scarves in lieu of ties and who decorates with such flair is sure to be a colorful character. But what I didn't know was how friendly, personable, and down to earth he is. Of course the fact that he peppered his conversations with anecdotes about Dorothy Draper only endeared him to me more. I could have listened to him for days! Carleton's new home accessories line for HSN bears the tagline "Live Vividly", something which suits Carleton to a tee. Vivid certainly described the set. 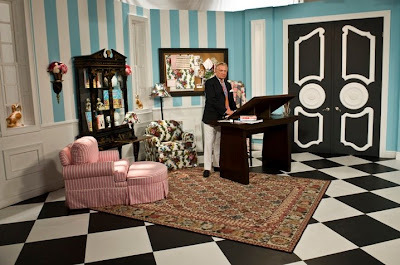 One side featured Carleton's "work" area, replete with bold aqua and white striped walls and a replica of that famous Dorothy Draper door from the Camellia House restaurant, not to mention the black and white tiled floor laid on the bias. 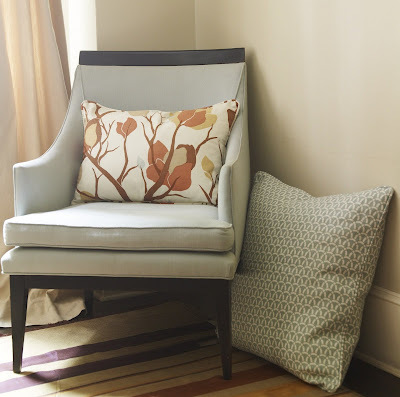 The armchairs are shown in Fudge Apron and Shannon Stripe with the matching ottoman. The Camelot rug is a reproduction of one from the Kennedy White House. The other side of the set was more of the "selling" area (my term) where Carleton's line was displayed. It really is a reflection of his (and to an extent Draper's) aesthetic. 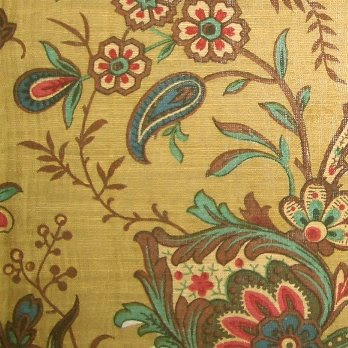 Many of Varney and Draper's classic prints like "Fudge Apron", "Shannon Stripe", and "Versailles" figured prominently in the collection. 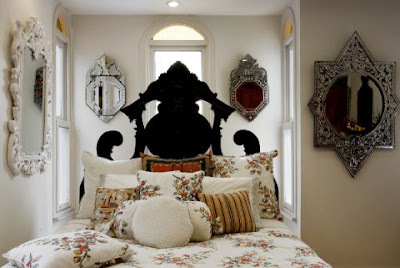 There are duvets, shams, sheets, and pillows which bear these prints, not to mention headboards, chairs, ottomans, and poufs. 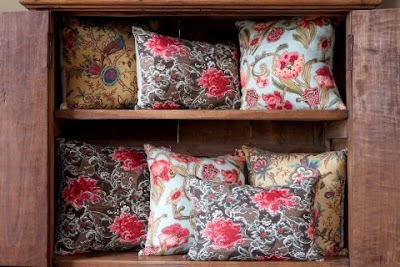 If you're not a print person or are averse to floral chintz, the upholstered pieces also come in an array of solids, including everyone's favorite, black. Carleton relayed the story about how Draper used to enter the office and say "Show me no gravy", meaning "spare me the beige". Carleton's quip is that he only wants to see oatmeal for breakfast, not in a room. This may not convince you neutral devotees to come over to the side of color, but it's amusing nonetheless. 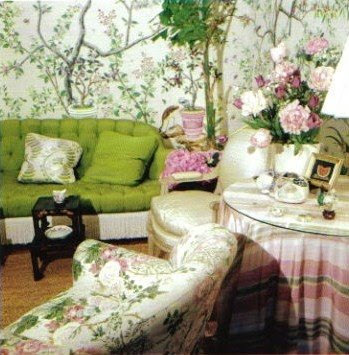 I ended up ordering a set of the Versailles sheets in pink because 1) Carleton inspired me to think beyond basic white and 2) "Versailles" is based on a swag print that covered the walls of the stairwell in Sybil Connolly's Merrion Square home, and I was a big fan of Connolly. One thing that really impressed me was the quality of the line. I wasn't sure what to expect, but I was very pleasantly surprised. 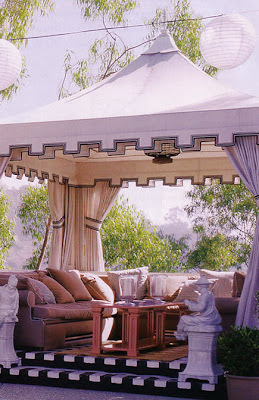 The upholstered pieces are made in the USA and are very sturdy and well-made. Carleton had me sit down in the boudoir chair, and I was amazed at how solid it seemed. And see those red socks that Carleton is wearing? He started doing so on the advice of the late actor Van Johnson. Something else to mention about the quality- I got a tour of the Quality Assurance building. You can't believe the amount of testing that the items go through. Textiles are weighed, then washed numerous times, then weighed again to determine if there's any shrinkage. When an item is received from a vendor, there's a drop test where the box, still sealed, is dropped from a specific height on all sides and then opened to see if there is damage inside. It's a fascinating process. Being behind the scenes of the show was truly amazing. Behind Carleton and me (he was explaining the concept of the line- live vividly and live happy) you'll see the Serious Skincare set. Well, during Carleton's show they would break away for a minute to give a sneak peek of the following show which happened to be Serious Skincare. 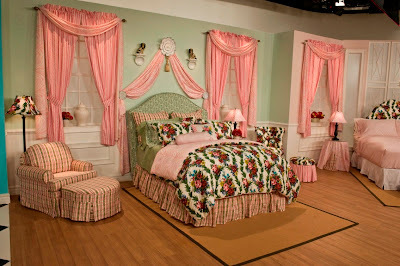 The cameras would just flip around and film the other side of the set. It was fun to catch Jennifer Flavin Stallone on the set. She looks good in person; maybe I need to start using the Serious Skincare. Carleton's next show will be in September with all new products, and I can't wait to see what he has up his sleeves. 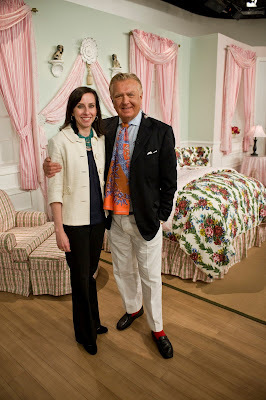 What I really wish is that you all could have joined me on set and behind the scenes at HSN. It was truly a fascinating experience to see what home shopping is really like! What can I say? I'm star-struck. I admit it! Chris Spitzmiller is currently having a Seconds Sale that runs through next Tuesday, July 21. 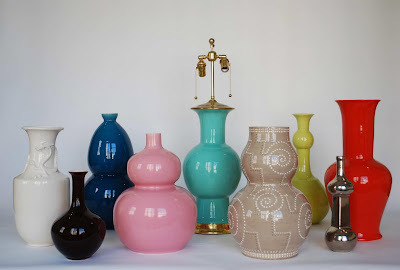 Lamps with slight ceramic imperfections will be offered at up to 55% off list price. Once you choose your form, you'll be able to select from mahogany, 23K gold water gilt, or 9K white gold water gilt bases. Lead time for custom fitting is 3-6 weeks. This is a great opportunity to buy one of Chris' gorgeous lamps at a discounted price. In fact, I've already decided which lamp I'll be buying! For more information, contact 212-563-1144. Visit Lulu DK Matouk for additional information. Return of the Brass Bed?